There is so much to learn from one's students...but you have to listen carefully! These very special people are such a large part of my life. I spend my days trying to do my best by them..for them. And I am rewarded by having the joy and opportunity to spend my days with them. At least most days I feel that way! I teach Grades 8 through 12, and I love problem solving with students. It never ceases to amaze me - seeing the problem through their eyes and seeing the different ways they come up with to tackle a problem. Yes, students are a large part of my PLN. Sometimes, if you listen carefully enough, you will find talents (other than mathematical) that they are willing to share with you. This is also quite special. One of my present students, Victor, shared his passion for origami with me. Victor showed me (many times and with great patience) how to make sonobe units so that I could make some modular geometrical units that I had seen him make. I was just so curious...and he was so willing to share. This holiday break, I decided to try my hand at a video - to demonstrate what Victor taught me. I hope to make him proud! I have been reflecting this holiday about how much we learn from students each and every day. Yes. We teachers are lucky folk...built-in PLN right in our classrooms! Following a conversation with some of my math teacher friends, I thought of a way to put our thoughts about the new Grade 12 Pre-Calculus curriculum to the test. - Wordle. Is the new MB Grade 12 Pre-Calculus curriculum mostly about functions? Is there an emphasis on explaining concepts? I made two word clouds using Wordle. The one above is made from an abbreviated version of the curriculum. The one below is made from all of the general outcomes and specific learning indicators. Keep in mind that all the mathy stuff (formulas, etc.) do not work in Wordle. These are the words used to describe our new course. My goals were simple starting off back in late November, 2012...or so I thought. After attending a terrific presentation by Gregory Kulowiec, I wanted to be a "connected educator". I have since learned that before I can become a connected educator, I have to be a connected learner. I must learn how to learn in this environment. And I have to be willing to share. Today I shared a SMART Notebook file outside of my school walls. It is a simple four page file for Pi Day, suitable for senior students. This was a first for me, and I was a bit nervous. Not as nervous as the day I posted my first video, but nervous just the same. I create files for my classroom every day - I love what I can do with the SMART Notebook software, and I love where I can take my students via this presentation tool. SMART Boards can sometimes get shunned in this collaborative and student centered environment we are trying to create. I suppose that if the board is used simply as a replacement for chalk talk, then I guess this kind of criticism is understandable. BUT, there is just so much to do with a SMART Board! I LOVE the interactive things you can do with it. I haven't showcased them in my Pi Day file, but I will in future postings and sharing out of files. If you are familiar with Thinglink, then this Pi Day file will make sense to you. It works just about the same. I used words instead of an image for the linking out to videos and related files. It is a great way to launch a lesson - curating links and files to suit a presentation. Happy to share the first of many SMART Board files...Pi Day, suitable for High School. Hope you have fun with it! If you have any ideas for future files, I would love to hear them! How rich a feeling...someone sharing a kind word. How rich a feeling...someone letting you know that what you did matters. I had been so nervous...and people had been so kind. I had no need to be nervous. Safe to say that not much gets sent my way via snail mail anymore, except for bills and the like. 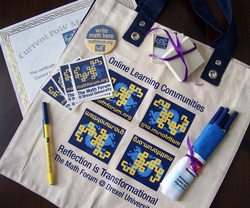 You can't imagine my excitement opening this parcel and finding a whole ton of Math Forum goodies inside! The best part of the whole parcel? 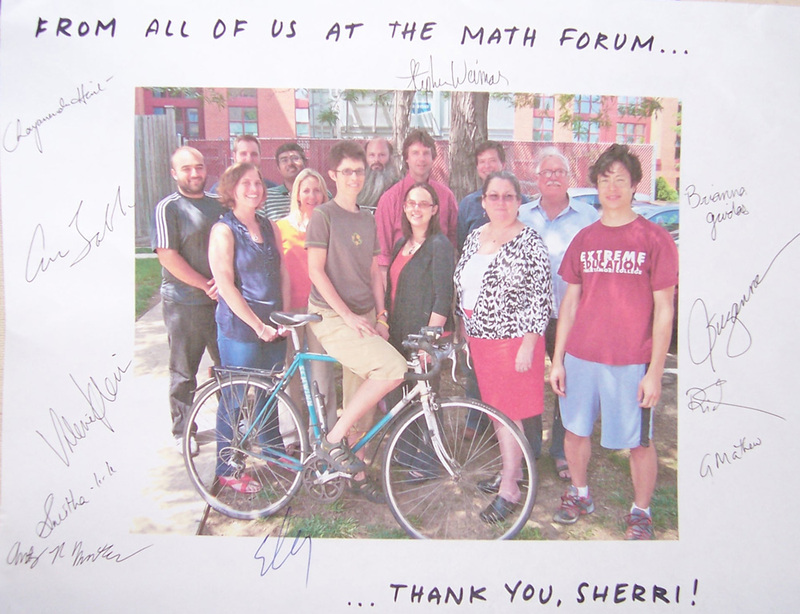 A photograph of the Math Forum team...with a note to me and signed by each of them individually! Wow! That someone was so kind as to take the time to do that for me...wow! Now, this is indeed a treasure! So, I will send them a tweet as soon as I post.I am writing this blog entry in hopes that they learn just how much their acts of kindness meant to me. Truly kind and encouraging people. Reading of their mission, I shouldn't be surprised - even though, I was delightfully so! The Math Forum has fostered many others, teachers and students, to help them "find their mathematical voice". To the wonderful folks at The Math Forum: Thank you for your support, your encouragement and helping me find my voice...AND for your delightful care package! How wonderfully caring of you all to send the love from The Math Forum all the way up here to the cold and wintery Peg in Manitoba! From the bottom of my heart, thank you! And should my students find answers for 83 and 88 for the 2013 Year game, I will share them right away! With no apology for the terrible pun in the title, the Show Me Videos have been a huge success with my Grade 9 class. These students celebrated the virtues of their first attempts after our class presentations. Next, they took what they learned from the first set and hit the iPads with enthusiasm and delight for their second round. Their solutions to Problem Set 2 show great improvement from their first attempts. Check out their Show Me videos by following this link to Problem Series B. It was most interesting to me to listen in on the various conversations taking place round the room while these students planned and plotted their next show-stopping Show Me solutions. They were quite deliberate with their planning, even though this was only their second attempt. They seem to have most of it figured out. It was made a bit more difficult for them, too, as I switched up the groups from the first round of solutions. Most noticeably, the Grade 9 students first made sure that each person in the group understood the problem and the solution, so that there would be no stalling during the video. For some groups, they had to choose the solution they liked best, as there were many ways to solve the some of the problems. There were compromises made and great cooperation and collaboration demonstrated. I continue to be impressed with their risk-taking. This is my take away from this week. To risk is to live. To risk is to grow. These kids are terrific risk takers, and they reap the rewards. Watching their faces as we viewed these videos...well, next time I will bring a camera to class! That was MY reward! I thought that it was going to be scariest posting on my blog for the first time. Wrong! The actual writing and posting wasn't that bad. I just wasn't prepared for the feeling of the AFTER POST! Now THAT was scary! Miles was right - blogging gold is a comment. Especially a nice one! His comment to my first post went a long way in making me feel more comfortable about the whole thing. I have so much to learn! When I shared this whole experience with my Grade 9 class (and my reasons for doing so), they confessed that they, too, were nervous about the sharing part. They were especially nervous and shy in that particular class period, as we were going to have the viewing party of their "Show Me" videos. My students explained that just as how I was feeling nervous about what people would write, they were feeling nervous about how their peers would respond to their videos. They pointed out that it would be more of challenge for everyone to be a kind audience, as they wouldn't be looking at people's faces. These students continue to impress me with their insights. We agreed that after each video that we would give three positive comments to the video-creators. They were so kind with one another, and they gave terrific feedback. it was such a positive class, and it was great for team building. I hope to remember to do this each time we present in this way. Now, I realize that on the SAMR scale ( I think that it is what it is called), that I am at the beginning stages...I am replacing the blackboard presentation with the "Show Me" presentation. I am feeling good about things, as we all have to start somewhere. I am moving forward with my students, and we are taking risks together. 1. I was able to practice and rehearse what I was going to say. 2. I was able to redo my presentation when I stuttered the first time around. 3. I will be able to go back and hear the solutions again this evening at home. 4. I found it way more entertaining to view the videos than to listen to someone at the board. 5. In the old way, only 8 people were presenting (1 for each question). By doing making the "Show Me" videos the way that we did, everyone is involved and has something to present. I am looking forward to our next adventures...we have started to connect with people on twitter. Vi Hart tweeted to them, as a matter of fact...and that was all VERY exciting! I will save that for a future posting. I spend much of my time in the classroom encouraging my students to share their learning. It occurred to me that my hesitation in starting a blog (other than I am not a writer of any sort at all) is that I am shy of doing just that. Sharing my learning. This was quite the "light-bulb" moment for me! Being a continuous learner is something I believe in wholeheartedly. So...if I am asking my students to go to that scary place and make themselves vulnerable by sharing, then I, too, must do the same thing. How convincing am I otherwise? What did I learn at school today? I learned that giving students a voice and giving students an audience makes for greater student engagement. This is really a "duh" moment when I really think about it. I posted their work on a newly created site called the Grade 9 Showcase, and I can hardly wait for our next class to view their "Show Me" creations as a group. So. There you have it. Two learning moments...a light-bulb and a duh. Not bad for one day! And sharing really wasn't so bad after all.